There are many reasons to use reflexology for women. The technique of reflexology helps with both overall balance in your body and specific health issues. Reflexology is over 5,000 years old originating from China. Simply explained, reflexology is an alternative medicine that’s used to treat and help regain balance to certain areas of your body. Experts even claim to use reflexology to help diagnose problems. 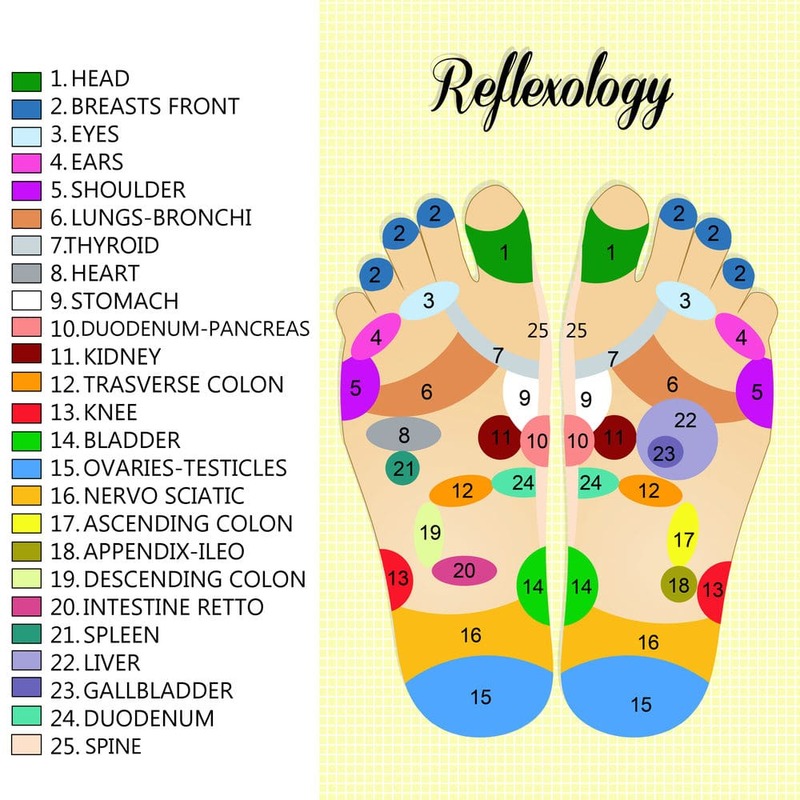 Using reflexology maps that show accupressure points on the feet, hands, and ears, you can find the link between the spots and systems in your body. Of course, we are by no means medical experts or suggesting that you use reflexology as a medical treatment. Please see a doctor before performing any type of at-home remedies. However, if you are an otherwise healthy person, reflexology is interesting and basically harmless to try. After Shelley tried the daith piercing for migraines and had excellent results, it reignited my interest in reflexology. 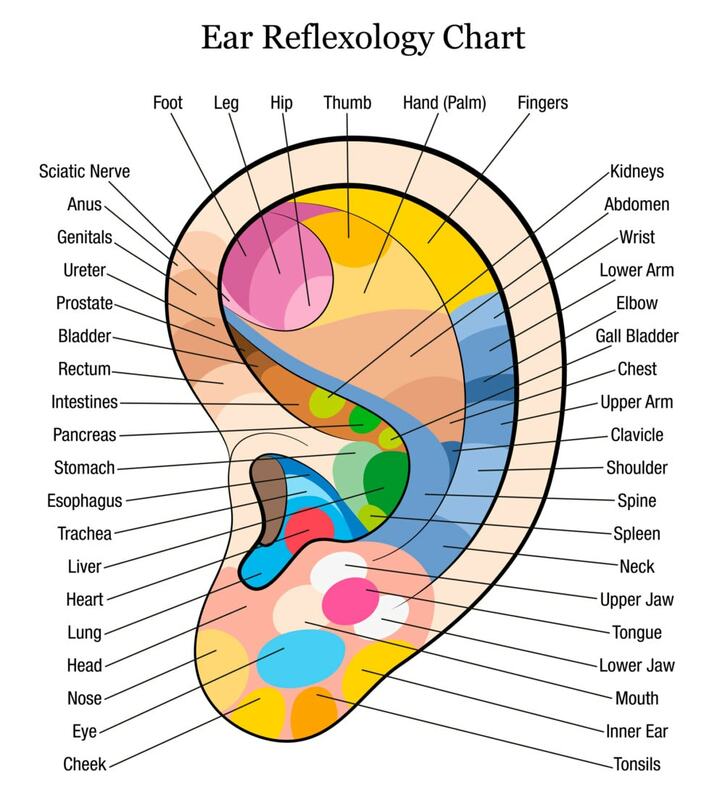 Although the image I show of the ear reflexology map doesn’t seem to show a clear spot that links to headaches, research is happening to make the connection between a pressure point on the daith and migraines. For women, there are several methods to try to help alleviate symptoms of PMS, stress, headaches, motion sickness, and fatigue. If you are an essential oil user, this is a fantastic way to incorporate oils into your body. Don’t forget to use the oils with a carrier oil, such as fractioned coconut oil to apply them. Here’s how to make DIY essential oil roller bottles which can be useful for this. Always drink plenty of water to help flush out toxins. PMS – Treating PMS with reflexology is done using both the feet and the hands. For most women, PMS happens a few weeks before their period. Keeping a journal of your symptoms is helpful. Pay attention to your body and begin doing reflexology for PMS before or right when the symptoms start. Start with your feet. Spend about 20 minutes on the feet overall, and do so up to three weeks before your period, but not during. First, work on the area over the liver reflex in your right foot. This helps release toxins from the blood as well as improve blood flow, suggested to relieve cramps. Next, massage the kidney and adrenal gland reflexes to help balance water and mineral levels. On your left roof, work over the spleen reflex to help detox your body. Find the reproductive system reflexes, the fallopian tube reflex, and the ovaries reflex and massage each one well to help increase circulation to those areas. Repeat the reproductive system reflex massage in the hands. Do so up to three times a week before menstruation and then after it ends. Essential oils suggested to use during reflexology for PMS are clary sage, patchouli, geranium, frankincense, bergamot, and ylang ylang. Headaches and emotional balance – Try these methods during your period when hormones cause headaches and emotional unbalance for many of us. Complimentary essential oils are wintergreen, frankincense, peppermint, basil, and marjoram. Begin by massaging up and down each finger on the front and the back. Find the spine reflex area which is near the wrist and massage it to help relieve tension and relax your spine. Work your feet for about 20 minutes. Massage each toe. Find the large intestines reflex as well as the lung, diaphragm, and the reproductive system reflexes. Massage the areas to help release tension, reduce bloating, lighten your mood, and aid in overall balance. Motion sickness – Not just for women, anyone who experiences motion sickness can try this reflexology technique. Oils to use are peppermint, orange, and fennel. Stroke the hands to begin the relaxation process. Shake out the hands lightly to keep the wrists loose. Find the spine reflex and work it to help calm nerves and release tension. For nausea relief, pressure is key. Apply pressure with your index finger to the point on the forearm that is right between the wrist tendons. Also, apply pressure to the eustachian tube reflex and pinch it gently. Fatigue – When you feel lethargic or sluggish, try reflexology to help boost your system and your mood. Plan to spend about 10 minutes on each hand. Suggested essential oils are frankincense, citrus oils, lavender, and patchouli. Begin by stretching and stroking each hand. Bend the fingers and gently stretch each one. Work the lung and diaphragm reflexes to encourage deeper breathing. Work the spine reflex to help lighten the whole body. Massage the large intestine, colon, spleen, pancreas, and stomach reflexes to help balance sugar levels and provide overall body balance. Have you tried reflexology for women? Let us know what works for you! Super interesting info. I used to know someone who swore by these techniques but I’d forgotten about them. I know they help a lot. This is a ton of amazing information, definitely going to be giving this a try! 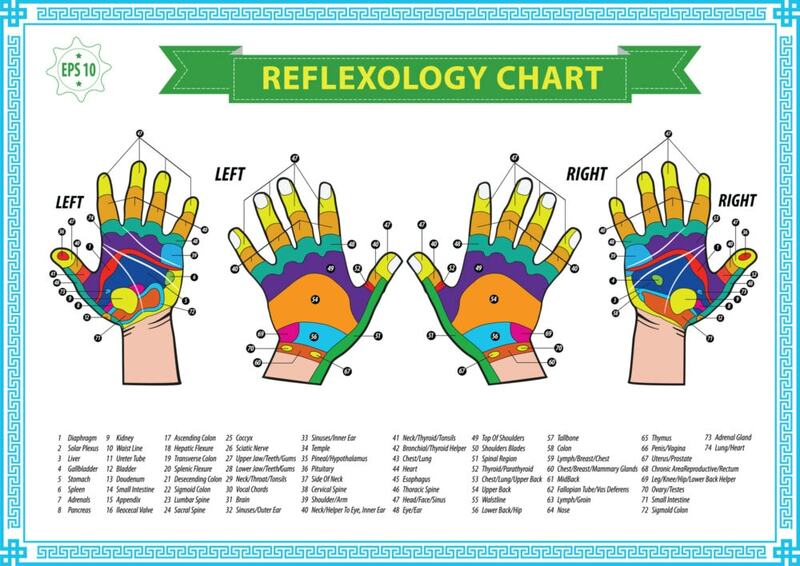 I’ve had a massage therapist who incorporates reflexology into her massages. I am definitely interested in Reflexology and natural remedies. These charts are wonderful to follow and look into trying. I had a book many years ago and lost it. I will massage my babys foot to calm him and it works. I really wish I could teach my husband these massages and points so that it can help me. Especially before my period. I remember years ago when this came out or rather when it became an alternative . I find it interesting and I believe it does work. I know that using tennis balls for your feet work very well, and they use pressure points. This is very interesting information. I know some people who say these techniques work for them. I have never heard of this but very interesting! I think I am going to give this a try.